We've all heard of 3D printing, and its many applications. Now, there is a company, "Made In Space" that is taking the term to new heights. Until now, everything manufactured for space was manufactured on earth then launched into space - an expensive endeavor with many limitations. The Zero-G printer is designed to operate in zero gravity, for "off-world" manufacturing. If successful, space-based 3D printing will vastly accelerate space development. Parts can be created on site for the International Space Station and spacecraft. Currently, Made In Space's 3D printer can manufacture 30% of the spare parts on the space station. 3D printing makes parts and products using a computer-driven, additive process. Plastic and metal parts are built directly from CAD drawings that have been cross sectioned into thousands of layers. The process is faster and more economical than machining (cutting, turning, grinding and drilling solid materials). The first version of the Zero-G Printer is scheduled to launch September 2014 under a joint partnership with NASA MSFC and Made in Space. It will be used to understand the effects of microgravity on 3D printing. 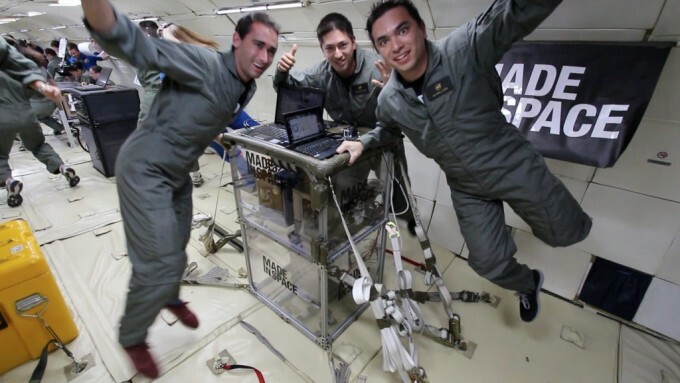 The makers of the Zero-G Printer hope to open the door to humanity's future in space.